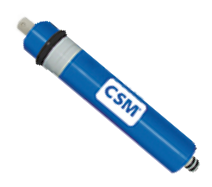 The CSM RE1812-50 is a very popular replacement RO membrane that fits in most 50 gallon per day (50 GPD) residential reverse osmosis systems. This thin-film composite (TFC) membrane has a minimum salt rejection rate of 96% (98% expected) based on a 200 mg/l(ppm) NaCl solution at 60 psi applied pressure and 15% recovery. CSM RE1812-50 residential RO membrane elements fit most standard nominal 2-inch I.D. pressure vessels. Accordingly, CSM RE1812-50 membranes will fit in most residential RO membrane housings, regardless of brand! Be sure to match capacities, not just physical size to ensure proper performance. Compare measurements below to confirm. * Capacity (permeate flow) and salt rejection based on the following test conditions: 200 ppm softened tap water, 77F (25C), 15% recovery and the specified applied pressure. Capacity for individual elements may vary. **Under certain conditions, the presence of free chlorine and other oxidizing agents will cause premature membrane failure. Since oxidation damage is not covered under warranty, we recommend removing residual free chlorine by pretreatment prior to membrane exposure. Most RO systems have carbon pre-filters for this purpose.